In a measuring jug mix the water, honey, yeast and oil together. Wait until the liquid goes frothy (about 10 minutes). Mix the liquid into the dry ingredients and pull together to form a ball. Turn the dough onto a clean surface and knead it for 5–8 minutes until smooth. Lightly oil a clean bowl, roll the dough in the bowl to coat all the surfaces with oil, cover with a clean cloth and leave in a warm place to double in size (about 15 minutes). Roll the dough out into a circle, which will fit the baking sheet on the baking tray. Transfer to the baking sheet. Spread the tomato sauce onto the dough circle, leaving an edge all around the pizza. You can add a ready-made tomato-based pasta sauce, chopped tomatoes or some red pesto sauce. You can also add some ready-cooked meat or other toppings of your choice. 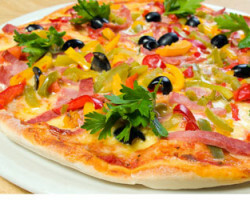 Don’t forget your vegetable toppings – pizza is an excellent way to reach your ’5-a-day’ fruit and vegetable target. Add your grated cheese to the top of your pizza last. Bake in a preheated oven at 200°C/gas mark 6 for 20 minutes until the pizza crust is crisp and golden.